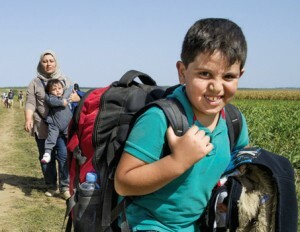 2015 has witnessed huge numbers of people setting off for new lives in Europe from countries across the Middle East and Africa, and in particular, Syria, Eritrea and Afghanistan. In many of these countries, conflict has been common-place for years, leading to unstable and unsafe places for young people to grow up. Getting to Europe, for the vast majority, has been a lengthy and tough ordeal, and as shown on the news, extremely dangerous. Some choose to travel by boat across the Mediterranean, or look to go through Turkey and into Eastern Europe on their way to a better life. So far this year, 134,000 people have crossed into Greece from Turkey and in total a quarter of a million have travelled across the Mediterranean. The reaction from European countries has been mixed. Some countries have welcomed people who have fled the region, such as Germany which anticipates 800,000 to reside there by the end of the year. However, this isn’t the case everywhere. Some countries have refused to take people in, or made travel very difficult. Hungary, for instance, put up barbed wire along its Balkan border to deter further people entering the country. The response from local communities across Europe has been fascinating and very varied. In certain areas, such as in Eastern Germany, there have been demonstrations and riots by those against the people settling in their town. Locals are concerned that it will be difficult for people to integrate into their society and the number entering the country is too great. In many places, however, the reaction has been very different – with placards saying “Welcome”, food, clothing and even a place to stay.